Increase your Internet presence … boost traffic … connect with customers … and take full advantage of all that social media has to offer! In just a few short years, social media has grown exponentially. What used to be primarily a way to keep up with "friends" and view funny videos is now a powerhouse marketing machine — embraced wholeheartedly by businesses from smaller startups to midrange companies to today's largest, most respected corporations. Facebook® , LinkedIn® , Twitter® , YouTube™, Blogs, Groupon™, Tumblr, StumbleUpon, Delicious, Reddit, … the possibilities are overwhelming! How do you decide which social media platforms are right for your business when there are so many out there? What are the differences? Which will best help you achieve your goals? How do you create a cross-platform campaign that will build brand awareness, increase revenue, drive traffic to your website and help you interact effectively with customers and prospects? The Social Media Marketing Conference — A one-way ticket to social media marketing success! 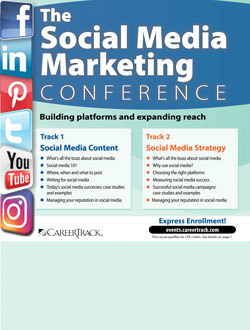 This conference was designed to help you navigate the "first tier" and "second tier" platforms, boost your social media marketing savvy, and discover how to reap the many benefits that go hand in hand with a smart, well-though-out social media marketing campaign. Explore the latest trends in social media, take a look at exciting new marketing techniques, and gain a social media "toolbox" chock full of tools, tips, tricks, and how-to's. We'll explore social media's hot new creative developments, look at cutting-edge media strategies you can deploy right away, and share a wealth of eye-opening ideas for integrating social media into your overall marketing plan. Spend one phenomenal day with us and become a social media marketing superstar! What's All the Buzz About Social Media? In this session, join both instructors for an eye-opening look at social media: what it is, how it works, the latest trends and developments and what you need to be aware of to fully utilize its powers for your own organization. This session will guide you in defining your social media goals and help you decide which conference track and/or individual sessions are the best fit for you. Status Updates, Tweets, News Feeds, Blog Entries … confused about where to post, when to post, even what to say in your posts? Take a deep breath and relax. This session walks you through your options and shows you where you should spend your time and efforts for optimum ROI. Believe it or not, there’s an art and science behind “social timing” — and we’ll reveal the best posting and updating times and methods for reaching specific audiences. We’ll also clue you in on what kind of content will best satisfy customer expectations, offer value, create interest and keep your readers coming back for more. Finding Your Social Media "Writing Voice"
Writing for social media is different from other types of business writing you may be familiar with. Your audience, message and method of delivery all differ greatly from corporate America’s typical memos, emails, reports and letters. If you ‘ve never written tweets, Facebook® posts, status updates, blog content, YouTube™ video descriptions or other social media content, chances are you’re nervous about starting out. In this session, you’ll discover best practices, writing tools and techniques for communicating via the primary platforms (Facebook®, Twitter®, blogs, etc.) and creating content that is relevant, interesting, informative and concise. How much content can you reuse, recycle and repurpose? Everyone on the planet seems to be feverishly tweeting, updating, blogging, posting, but who’s actually successful at it? Which businesses are growing and thriving due to well-thought-out social media marketing plans? Which ones are enjoying increased profits and seeing positive Internet buzz about their products and services? Who interacts with and supports their customers through social media? In this session, we’ll provide you with examples of companies who have valued social media presences that reflect their corporate identities and principles. You’ll see how they are able to leverage the power of the platforms without compromising who they are. And you’ll discover how modeling their social media successes will help you achieve your own. Why Use Social Media? What Can It Do for You? As more and more individuals and businesses climb aboard the social media bandwagon, you may be wondering if it’s all really worth it. What’s behind the hype? Is social media really the next big marketing tool for businesses? How can you harness its power for your own organization? In this session, we’ll show you how to create, expand and manage your organization’s social media presence. We will also discuss how social media can be used successfully to market products and services, promote your name and brand, generate leads, increase revenue, build brand awareness and connect with customers. Your customers use social media, shouldn’t you? Creating a marketing campaign through social media may seem overwhelming — there are so many platforms to choose from! Facebook®, LinkedIn®, Twitter®, Blogging, while these seem like obvious choices, what about YouTube™, Instagram®, Pinterest®, Snapchat, Tumblr® or Reddit®? We’ll help you sort through other popular platforms and determine which will meet your organization’s social media marketing goals, including advertising, distributing information about new products and services, networking and keeping up with your customers. You’ll also learn which platforms provide the best opportunities for expanding your social media footprint once you’ve mastered the basics. “I am running several social media sites and have deployed several campaigns, but I am not sure if they were successful or not …” Luckily, you don’t have to take the “throw it against the wall and see if it sticks” approach to measure your social media efforts. Your social media ROI can be measured accurately, in any number of ways: increased revenue, new customers, brand awareness — whatever results are most important to you. In this session, you’ll learn what to measure, how to measure and how to interpret your results. We’ll reveal numerous tools, formulas and metrics for measuring, tracking and analyzing your social media campaigns across the various platforms. What can you measure? Re-tweets? Likes? Comments? Page views? Shares?… How do you use that information? What is the most important social media metric? What defines a great social media marketing campaign? What should your campaigns include to be successful? How do other companies do it — and what can you take away from their best practices? A good social media campaign engages readers and is compelling, imaginative and interactive. It is also targeted to a specific market segment and utilizes the platforms that will best reach that targeted audience. In this session, we’ll delve into real-world examples of some highly effective campaigns, and show you how to borrow from their successes to create your own. What are the elements of a successful campaign? One of social media’s greatest assets — its interactive, all-access nature — is also its greatest shortcoming. Online reputations can be destroyed with a single click, a negative video can go viral in an instant and a few negative comments can quickly morph into a collective feeding frenzy. How do you manage your company’s reputation through social media? Can you prevent negativity from tarnishing what you’ve worked so hard to build? Should you even try? These are tough, timely questions, and we’ll answer them all — honestly and straightforwardly — in this closing segment.